Everything worked out fine in the end. The TL soundtrack is a thing of beauty and awe. The music was one of Tron Legacy‘s most impressive aspects and integrated so well into the visuals that they seemed symbiotic. I remember sitting in the cinema, of the winter of 2010, being immediately blown away by the opening salvo of Overture and The Grid, and The Son Of Flynn. Track four (Recognizer) on the soundtrack was the defining moment, initially, for me in the cinema; it was the scene where Sam gets caught by the Recognizer – and it looked amazing and sounded incredible. I remember thinking “this is one of the best scenes in a movie I think I’ve seen” – I was pretty caught up in the film by this point, so please forgive my fanboy gush. The film is, essentially, a sequence of beautifully staged and filmed set-pieces put to stunning music. And by gosh it works so well. 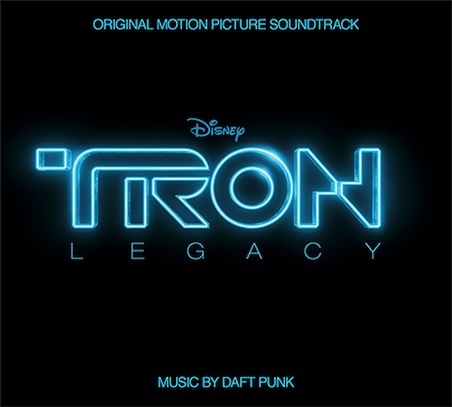 Daft Punk (comprising the duo of Thomas Bangalter and Guy-Manuel de Homem-Christo) have produced a superb soundtrack that works equally well as a standalone record – they balance their trademark electronica with sweeping orchestral work, and the two styles mesh wonderfully (see the amazing tracks 9: Outlands and, more so, 10: Adagio For Tron as testament). DP really hit their stride with the more conventional club segment (where, in the film, the duo made their unusually memorable cameos) of tracks End Of Line and Derezzed, which are the nearest to their usual sound. 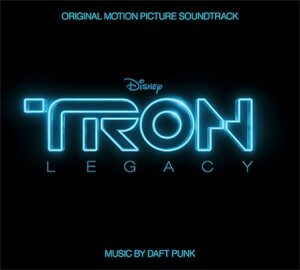 This is an essential purchase for fans of Tron and/or Daft Punk, and anyone with taste, I think it fair to say.